In today’s fast paced world, everyone is on a time crunch. Buildings go from blue print to ribbon cutting in a speed never seen before. Lutron Electronics—the lighting controls pioneer—saw a need for a new type of commercial controls system. A system that could save electrical contractors time, money, and headache. 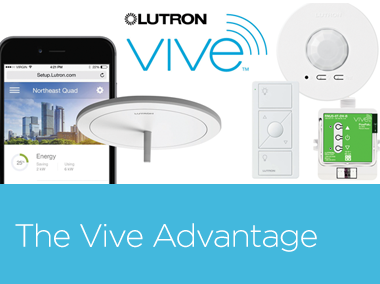 Vive is Lutron’s answer to expedited timelines, and shrinking budgets. This new commercial, modular, wireless lighting control solution is easy to use, and equips it’s user with simple control components eradicating the typical steep overhead of traditional systems. Vive provides the versatility needed to design buildings with wireless capabilities to simplify installation and minimize call backs, all while maximizing productivity and building performance. Vive is wireless. You can start small and build on the system later. No wiring required. Less wiring also accelerates installation, and shrinks labor costs by up to 70%. Setup is as simple as pushing a button or using a smart phone or tablet, further reducing time and labor cost, with no manufacturer commissioning required. Vive utilizes BACnet protocol to connect with other building systems during initial installation or whenever the system is ready to be built out. Vive is made up of four main components: a Vive Hub, occupancy sensors, daylight sensors, and dimming modules. Using a wireless system like Vive can save your customers a large percentage of their budget, all while allowing you to make more than ever. With Vive, you have the ability to take on more projects, because Vive jobs don’t require the man-power and time that other control systems necessitate. Installation costs can drive a project’s budget into tailspin. With Vive, you can come in under budget every time by providing a solution that doesn’t require wiring a traditional control system – a Vive retrofit can be done in 70% less time than a wired system. Using Vive makes you the hero! You can beat competitor’s pricing with traditional systems, complete the install faster than ever, and provide a state of the art, user friendly system.